SOLOMON! HERCULES! ATLAS! ZEUS! ACHILLES! MERCURY! “What on Earth are you talking about?” I hear you cry. Well those are the names of the gods whose powers you’ll be imbued with if you meet a wizard in a dark abandoned subway car and he decides that you’re worthy. Let me take you back to 1939 when a company called Fawcett Comics published a comic called Whiz Comics #2, which starred a character called Captain Marvel (we’ll come back to that). The hero was the alter ego of a young boy named Billy Batson, who, when he called out the acronym SHAZAM of the six “Immortal Elders,” would become an adult costumed superhero who could fly, had superhuman strength, moved with super speed, and a found himself with whole bunch of other powers over time. And since he’s got a new movie coming out (as you may have seen out of this year’s San Diego Comic-Con), we figured we’d run you through his backstory. Billy began his journey as a young orphan who accidentally discovered the lair of the Wizard SHAZAM when he wandered into an abandoned subway station and a magical subway car in the interestingly titled aforementioned Whiz Comics #2 (we say “interestingly titled” because there was never a Whiz Comics #1). The issue was drawn by artist C. C. Beck and written by Bill Parker, and sparked what was undoubtedly the most popular comic book series of its day. Whiz Comics #2 even outsold Superman, which led Fawcett to create the Marvel Family, a team of superpowered kids who could also wield the power of SHAZAM. The original issue also introduced one of Billy Batson’s longest running foes: Dr. Sivana. The villain originally began as a humanitarian who wanted to better the world, but who was driven to evil by giant corporations and violent conservatism. Sivana is also a cosmic comic bad guy as he got so sick of Earth that he actually moved to Venus before heading back to our world and becoming the first person to realize Billy Batson was actually Captain Marvel, leading to an ongoing battle between the two characters. Billy Batson was so popular that in 1941 he got his own series, Captain Marvel Adventures—he also earned a movie the very same year—which soon became the most popular comic of its time, and one of the best-selling of all time with a reported circulation of 1.3 million copies a month. 1941 was also the year that would change Captain Marvel’s history forever, as National Comics (now known as DC) sued Fawcett for copyright infringement, claiming that Captain Marvel was a ripoff of Superman. Though it would take a decade and a couple of different trials and appeals—as well as a decline in sales—Fawcett eventually agreed to permanently cease publication of Captain Marvel in 1951, closing their comic book doors forever in 1953. It wouldn’t be until almost 20 years later that DC would license the Captain Marvel characters, relaunching the book under the title Shazam! This was due to a copyright issue with a Marvel Comics character with the same name who was established in 1967 when the rights for the original were murky at best. We speak, of course, of Captain Marvel A.K.A. Mar-Vell, forebear to Carol Danvers. Over at DC, however, original artist C. C. Beck joined writer Denny O’Neil for new tales and the book even held the subtitle “The Original Captain Marvel” for a short period before changing to “The World’s Mightiest Mortal.” The stories retold Billy’s classic origin and retconned the huge gap in continuity by explaining that Sivana had trapped the Marvel Family in suspended animation for 20 years. Though the series was heavily advertised by the publisher, the reception from fans was relatively lukewarm. In 1985’s Crisis on Infinite Earths, the Shazam family was introduced into main DC Comics continuity. By 1991, the company had acquired all of the Shazam characters. 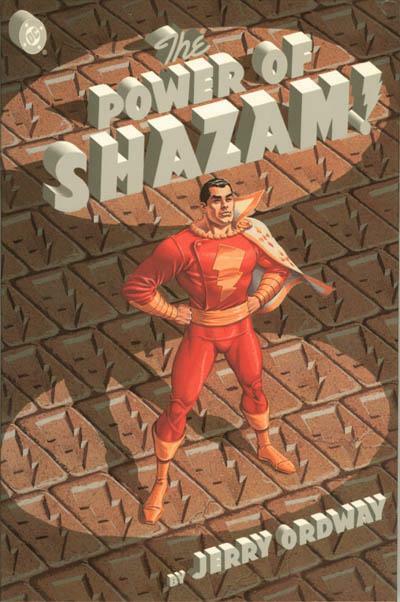 In 1994, writer-artist Jerry Ordway authored an original graphic novel called The Power of Shazam, this take on the red, white, and gold champion of orphans everywhere saw Billy’s parents as archeologists in Egypt murdered by their partner Theo Adam. Otherwise, Billy’s origin stayed relatively close to the original Fawcett comic. The Power of Shazam was popular enough to get an ongoing series that ran until the end of the ’90s. But, as time would have it, Captain Marvel again fell by the wayside at the end of the decade, making only sporadic appearances in other titles or testing the waters with his own occasional miniseries in the ’00s. The Marvel Family antagonist and anti-hero Black Adam grew into his own during this period, becoming a focal character in the experimental weekly series simply titled 52. But that iteration of the Marvel Family was to be short-lived, as the entire DC line relaunched yet again with The New 52 initiative in 2011, where Captain Marvel was officially renamed Shazam for good and given his own recurring backup feature in the ongoing Justice League series. This era also included a lot of non-continuity stories like Kingdom Come and The Power of Hope. In these backups, Geoff Johns and Gary Frank provided their own take on Billy’s classic origin, the newly-christened Shazam Family, and Black Adam for a couple of years. If you’re excited about the upcoming Shazam movie, you might do well to have a look Johns and Frank’s New 52 run, which looks to be a huge influence on the film. The entire New 52 line was relaunched with Rebirth, leaving the DC Shazam-less until very, very recently. It’s been announced that this November will see a new Shazam series by Johns and Dale Eaglesham, just in time to reintroduce the character to new audiences before the film drops in April! Now you’re all caught up on your new fave character, do you have a personal pick for a Shazam origin? Can’t wait to see Billy Batson on screen once again? Let us know below!